It’s only really by driving a car that you can get a good impression of it, and I have been very fortunate to be offered the chance to borrow a brand new 2018 Nissan Leaf Tekna, complete with ProPilot, for two days. This was kindly lent to me by Annie Cooper, the Sales Manager at Sandicliffe Nissan in Nottingham. I have heard various claims regarding the range of the new Nissan Leaf afforded by the 40 kWh battery, but the figure I have heard quoted as “real-world range” is 150 miles. With that in mind, I was intending to do a journey of 150 miles, to match the range, but making the journey from Nottingham rather than my home added an extra 25 miles onto the trip. My destination was the H2O Cafe, near the Wyche cutting in Malvern, Worcestershire (in the UK, where I live). 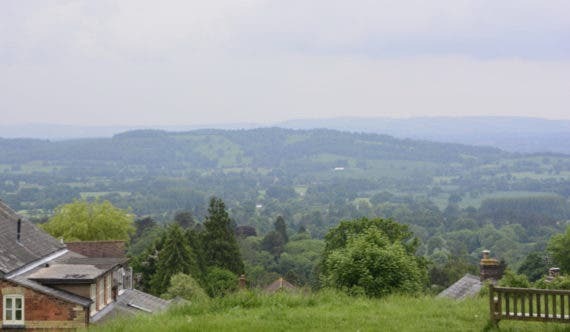 Malvern is where I lived as a child, and has a beautiful range of hills, unsurprisingly called the Malvern Hills, which are a beautiful place to visit. The added attraction of the H2O Cafe is that it has level 2 charging, provided free to customers, and also the Wyche Cutting is the highest road on the Malvern Hills, so it lets the car do all the hard work of hill-climbing, leaving me with only a leisurely stroll to get up onto the top of the hill. Wyche Cutting is 900 feet above sea level, and the hills rise up to 1,394 feet, providing marvellous views across both Worcestershire, to the East, and Herefordshire, to the West. Of course, the purpose of this journey was not just to have a pleasant day out, but to give the car a thorough road test, so that I could write a report for EV Obsession, and CleanTechnica. For a 40 minute YouTube video of the car, my journey, and my commentary, click the video thumbnail. I was intrigued by the ProPilot semi-autonomous driving system. It was very easy to operate, just requiring the press of a button on the right spoke of the steering wheel. Once engaged, the required cruising speed can be selected by pressing on the plus or minus buttons to go up and down. 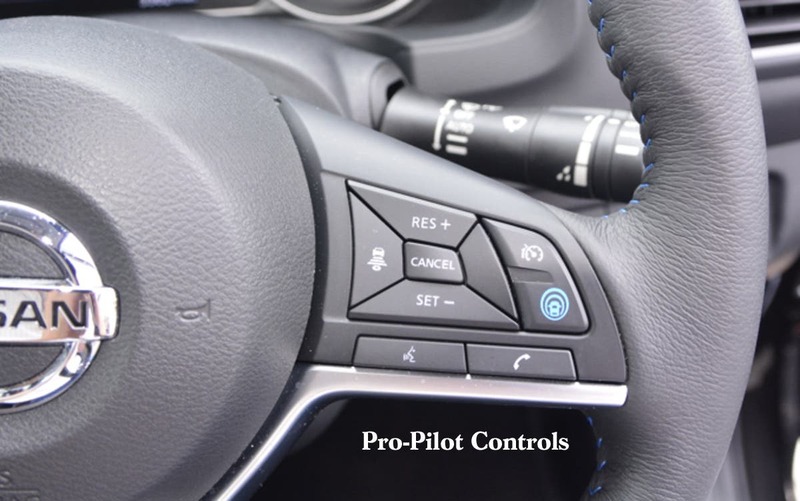 The ProPilot system monitors the vehicle in front of the car and automatically adjusts the speed to keep a safe distance, up to the maximum cruising speed set by the driver. 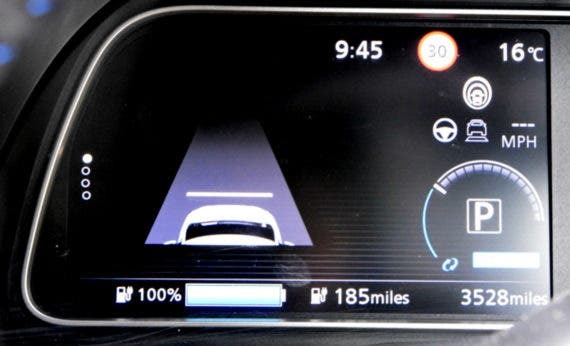 The driver can also choose one of 3 safe distances from the vehicle in front, which are indicated by bars on a schematic showing a picture of a car with the bars in front of it. [Editor’s note: Tesla’s Autopilot offers 7 levels to choose from.] Finally, ProPilot also observes the lane markings and steers the car to keep in the middle of them. This is not a forceful kind of steering that overrides the driver’s control, but just a gentle nudge to the steering wheel. 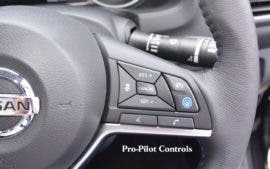 I found it very relaxing driving with ProPilot. I could take my feet off the pedals and rely on the car to control the speed and the distance from the car in front. I held the steering wheel lightly, and just allowed ProPilot to nudge the steering wheel in the right direction to keep in the lane. It was almost like being a passenger in the car, a very relaxing way to drive on the motorway, but the system ensured that my hands were on the wheel at all times, and I was in no doubt that I was in charge of the car. ProPilot was just assisting my driving, to make it easier for me. If I took my hands off the wheel, this began a progressively loud warning signal which is impossible to ignore. I felt this was a very safe system and made motorway driving much more relaxing. Another unique feature of the new Nissan Leaf is what they call the “e-pedal.” There was a blue button to engage this on the centre console. Most people who drive electric cars are already used to one-pedal driving, to a certain extent. This is because the regenerative braking on an electric vehicle comes into play on releasing the accelerator pedal. When I drive my Peugeot Ion, I hardly ever use the brake pedal, but just control the speed with the accelerator pedal and regenerative braking. I only use the brake pedal for unexpected events, and to hold the car at junctions and traffic queues. Sometimes, though, the regenerative braking is not sufficient, and I then touch the brake pedal, which provides additional regenerative braking. I have no idea why manufacturers set up regenerative braking in this way — it just seems to be pandering to some idea of what is “normal,” where that relates to ICE cars, not EVs. However, the e-pedal completely discards that “normality,” and not only puts all of the regenerative braking onto the accelerator pedal, but also eventually engages the friction brakes to enable the car to come to a complete stop, and to even hold the car on a hill. This means, of course, that you have to be more careful in easing off the pressure on the accelerator pedal. I found the car very responsive to this easing off, and was able to precisely control the level of braking by controlling how much I lifted my foot from the accelerator pedal. 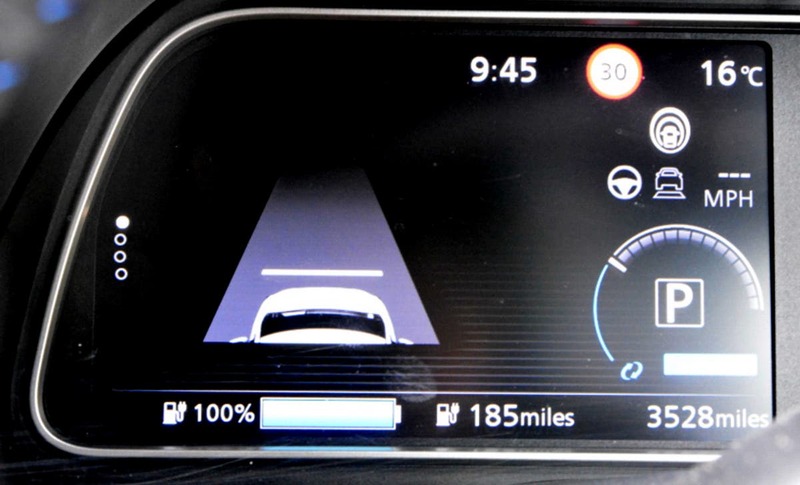 The car has a segmented circular electrical current indicator, with blue segments to indicate the level of regenerative braking, so it was possible using the e-pedal carefully to avoid the friction brakes, except when actually wanting to stop. Of course, I could still use the brake pedal with e-pedal mode set, and so could respond to any kind of emergency. It seems to me that the e-pedal is what should be normal in all electric cars, and is a great step forward, making driving so much easier. It is also safer, because there is no delay between lifting the foot from the accelerator and the brakes being applied, as there would be in a conventional car. That provides life-saving fractions of a second in an emergency, with potentially much shorter stopping distances. The only time the e-pedal is not so good is when doing slow-speed maneuvering, such as in a car park (parking lot) or backing up, because the brakes coming on and then off makes progress a bit jerky, rather than the smooth, very incremental speed control you want in slow-speed maneuvering. It is a simple matter to turn it off and then back on for the rest of the time when it is a real plus-point. Through a combination of the selector and buttons the driver can select 3 different driving modes. There is a “B” mode in addition to the normal “D” mode, where there is additional regenerative braking, and an “eco mode” for saving the battery, so there is quite a lot of choice available. The selector is another departure from the norm. Some electric cars have a selector which mimics the selector for an automatic gearbox, so that the selector looks like a gear lever, and just as in an automatic, has “Park,” “Neutral,” “Reverse,” and “Drive” positions. 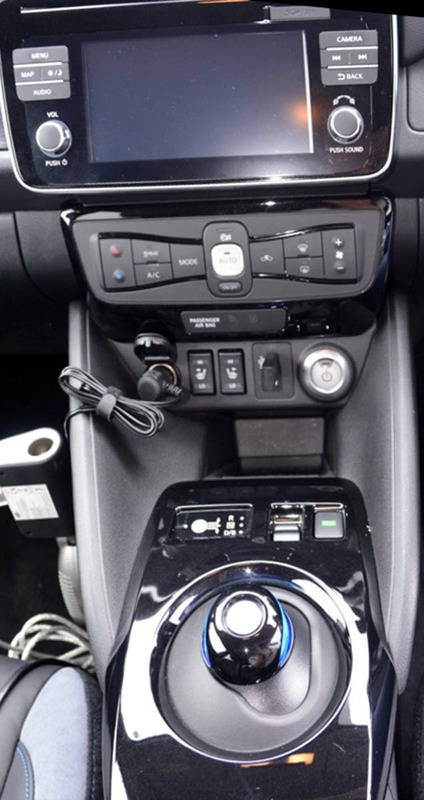 Renault Zoe, the previous Nissan Leaf, and the Mitsubishi i-MiEV are like that, but Teslas have something like the old-fashioned steering-column-mounted gear shift, and the BMW i3 has a chunky, column-mounted knob. Of course, this is the way design evolves. If you think back to the early motorcars, they were not only called “horseless carriages” but looked like a carriage without the horse. It took a long time to move away from that to what we have today. In the same way, electric vehicles are made to look and behave just like internal-combustion-engine (ICE) vehicles, and it might take some time for their design to evolve, but the new Nissan Leaf is certainly taking steps in the right direction. I’m sure it will take a while for all these different approaches to arrive at the best solution, but the new Leaf’s rocking ball in the palm of the hand is quite nice to use and works well, once you get used to it. Any driver trading up from an old-fashioned ICE car will be used to operating some kind of gear lever — automatic or manual — with the left hand, and so will find a selector of this kind very intuitive to use. 150-Mile Range … Or Is That 200 Miles of Range? When I was told that the Nissan Leaf has a real-world range of 150 miles, I expected that to be an exaggeration, since with motor vehicles, you usually get less of whatever is stated (such as mpg). When I had been driving down the motorway for a quite a while, I noticed that the battery was down to 50%, but the calculator for range, which works that out by looking at how far you have travelled and the amount of battery capacity used, stated remaining range as 101 miles. This meant that driving under the same conditions with 100% charge, the range would be 202 miles, so I was very pleased with that. Of course, few drivers are going to risk getting down to “Zero” range before charging up, and most allow a minimum of 20%, so that 202 miles would allow around 160 miles before charging. Also, the system cannot allow a battery to actually go completely flat, as this damages the battery, so even when the indicator says “Zero,” you might well have about 10% in reserve. Because I miscalculated, somewhat, on one journey in my own car, the gauge was showing “Zero” for quite a few miles before I finally got home, and the car was running on “fairy dust” with no obvious problem. I was at the destination for about an hour, with the vehicle plugged into a level 2 charger. This was while I had a nice pot of tea and a bite to eat at the H2O Cafe, as well as a pleasant walk on the Malvern Hills enjoying the fresh air and the marvellous views across the Severn Valley. The charge level was about 45% when I arrived, and after only one hour, it was at over 70%, which represents about 50 miles of motoring based on the 200 mile range. I could have got home quite comfortably with that 70%. However, we did stop at Hopwood Park Services on the M42 on the way back, just to try out the level 3 charging. I spent 25 min at Hopwood Park. It was a very pleasant and sunny day, and they have some parkland attached to the services, which includes a natural water disposal system that directs rainwater from the roofs and car parks through natural filtering beds and pools before releasing the clean water into the local stream. In the hot weather, looking round the streams, pools, and all the water plants made a pleasant walk to pass the time. In that 25 mins, the charge level went from 50% to 85%, which was a very good rate of charge. In my own electric car, I would normally charge from around 40% to 80% in about 20 mins, which is a slightly higher increase in percentage in slightly less time. However, my battery is only 16 kWh, whereas the Leaf battery is 40 kWh, which is 2½ times the size, and so, to reach that similar percentage in that time is charging about twice as fast. This tends to confirm what I have suggested to be the case: the bigger the battery, the more cells there are to channel the current, so the more current can flow through it. 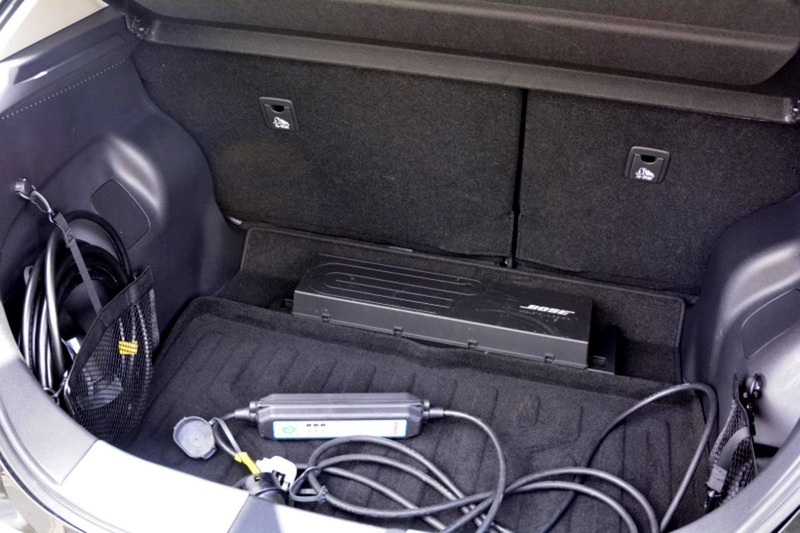 So, a bigger battery does not necessarily mean longer charging times, depending on what currents the charger is able to deliver and the car’s onboard charging system is able to receive. However, expected or not, it is impressive that the Leaf has such a good range, combined with a fast rate of charging, making long journeys possible without too many charging stops. I should say, though, that on the way down to Malvern, I stopped twice, just to have a break, and I could have plugged the car into a charger on both of those occasions. I could, therefore, have done that same journey in the same time in a car with less range, so I really think all the concern about the range of electric vehicles is entirely unnecessary. Having said that, I would be very pleased if my own electric vehicle had the same sort of range as the new Leaf, as it does make driving much more flexible, in terms of when and where to stop. One of the longest journeys I make, to visit my youngest daughter in Somerset, is 151 miles, and so, in the new Nissan Leaf, I could drive the whole journey without stopping at all. Of course, I would stop, but only when and where I wanted to, and not where forced to by the necessity to charge the battery. There is certainly no need for any EV to have the range that a tank full of fuel gives the average ICE car; that is a totally arbitrary idea. Filling up a tank with fuel is smelly, messy, time-consuming, and expensive, so drivers do not want to be doing it more often than necessity demands. Plugging in an EV is clean, simple, quick, and cheap, so can be done whenever the opportunity arises. Ultimately, the minimum range a car needs is the distance the average driver would drive before taking a break, which is probably only 100 miles. In the morning, on starting out on the journey to Nottingham to return the car, having plugged the car into my home charger overnight after I had arrived home, the battery was 100% charged, with a calculated range of 185 miles. So, that is 15 miles less than the 200 we had earlier, but then, once off the motorway and driving into Malvern, we were not only stopping and starting, but also climbing about 700 feet for 5 miles from Malvern Link all the way to the top of the hill at the Wych Cutting, so 185 miles was still a very good level of range. One more thing to mention about charging on the Nissan Leaf is that the charging port is situated at the front of the bonnet (or “hood” as our US friends call it). It has its own charging port door, opened by a switch on the dashboard, and also contains a light for connecting up at night. It is a very good idea, also on the earlier Leaf, to have the charging port at the front, so that one can drive up to the charger rather than having to reverse up to it. It also makes the charging port as close as possible to the charger. 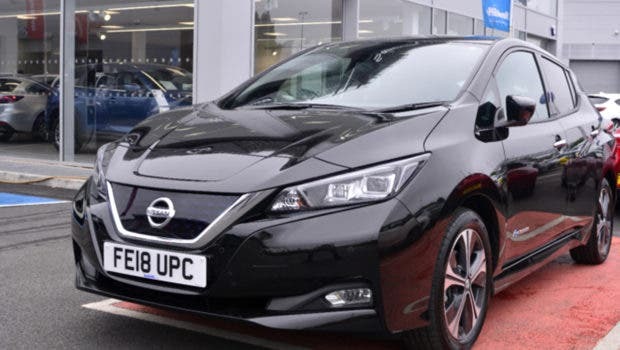 A further advantage for UK drivers is that the Nissan Leaf, being a Japanese car, uses the Japanese fast-charging standard of CHAdeMO and the EU standard Menekes connector for level 2 charging. 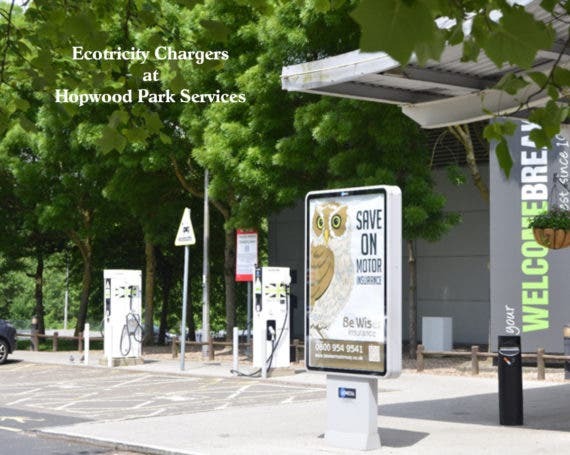 Almost every service area on the UK motorway system has a fast-charger provided by Nissan, some with EU funding and all operated by Ecotricity. All of these have a CHAdeMO connector and an AC connector (for Renault EVs), but only some have a CCS connector. A small number also have a level 2 charger, which can be handy for a quick top-up, free of charge. 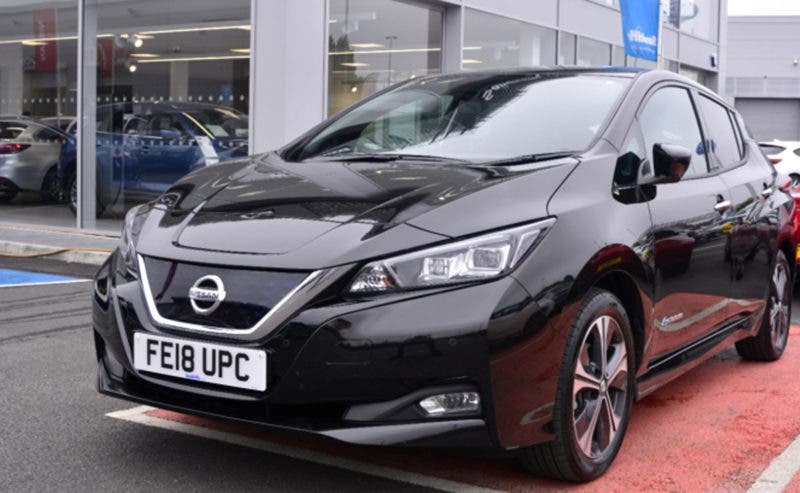 Nissan Leaf drivers will always be able to connect up, which might explain why the Nissan Leaf is the #1 selling electric car in the UK. EVs using CCS are not so lucky, and some Renault Zoe cars do not have any fast charging, which is a distinct disadvantage on long journeys. So, I think that is enough about charging and range, so let us move onto other things. I am 6’2” tall, so need a reasonably roomy car to fit into. From the moment I sat in the driving seat, I felt very comfortable, with plenty of head room and room for my legs. All that I needed to use was easily accessible. I had a brief familiarisation with the car before I took it from the dealer in Nottingham, but, in any case, I found the controls very intuitive and easy to use, despite my inexperience. I did have a couple of panic moments on the journey. My satellite navigation system that I had brought with me because it had the destination and all of the charging points preprogrammed into it decided to die on me halfway there. 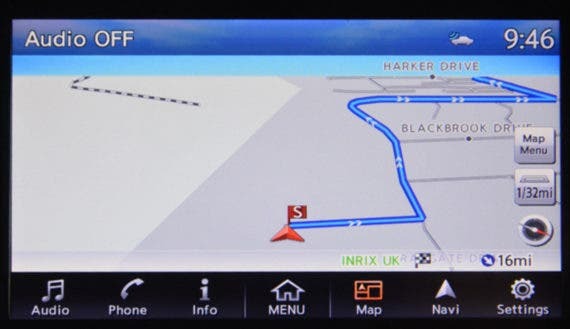 I have been using that system for years, and so am fully familiar with it, which was another reason for using it in preference to the onboard satellite navigation system. However, I found the display screen on the Nissan Leaf very easy and intuitive to use, and I quickly identified everything I needed to do to put the destination into the satellite navigation system and create a new route. The system was excellent, as it had a nice big screen just where I could glance at it without obscuring the windscreen at all. The voice came through the onboard sound system, which was a very superior Bose system and so was ultra-clear. Being a bit hard of hearing in my old age, that was a big plus point. So, that is one example of where I had to use a system on the Nissan Leaf which I had not been shown and had no instructions for but nonetheless found very easy to use. I had another moment of panic when I reached the destination all ready to plug into the level 2 charger but realised that I didn’t know how to open the charge-port door. There, again, the controls were very intuitive and I quickly found the right button to press on the dashboard (I think there is a button on the remote control too, which I did not notice at the time). After spending a pleasant hour drinking tea and walking on the hills, when I came to disconnect the charger, I found that the connectors were both locked in place. Although this is a good feature, as it prevents anyone from disconnecting your charger cable, it was another moment of slight panic, but pressing that same button on the dashboard solved that problem, too. So, again, that was a big plus point for the controls on the Nissan Leaf, as they were very easy to understand and make use of. As for the appearance of the car, I thought it very stylish, though style is a matter of taste and there are plenty of photographs to look at to make up your mind about that. I must admit that I have never bought a car for its appearance in any case, as practicality and performance are more important to me. The Nissan Leaf is a full-size family hatchback, with 5 seats and plenty of luggage space at the back. It felt very sure-footed on the road. The suspension was soft enough to be comfortable, but hard enough to sit firmly on the road. Electric cars have a low centre of gravity in any case, with most of the weight at axle level and an even weight distribution, and so have superior handling compared to most conventional ICE cars. This was very apparent with the Nissan Leaf. Being electric, it is also very quiet, making for a much more restful driving environment. The power steering was very smooth and light, and I felt at all times in full control of the car. The Tekna also has a heat pump for warmth, which is easy on the battery, and a heated steering wheel and seats; all great for winter driving. Like most cars these days, it has good air conditioning for the warm summer days. Although most of the time I was driving in a fairly relaxed manner, taking things easy and enjoying the drive, there was one incident in Malvern where I discovered the depths of performance hidden in this seemingly sedate family car. There is a notorious Y-junction in Malvern, where the road comes down off the hills to join a main road. I had to negotiate this junction and found that because the main road dips down at the junction and is partially hidden behind a stone wall, it is impossible to see what is coming. I cautiously crept out into the main road, hoping to reach a position where I could see down the road and drive off safely. I had no such luck. As soon as I had reached the point of no return, I found a car bearing down on me from the main road. The only thing I could rely on was the well-known ability of electric cars to accelerate smoothly and quickly away from the junction. I did well to rely on it, but it went way beyond my expectations. There was a squeal of tyre rubber, I was thrown back into my seat, hanging onto the steering wheel, and before I knew it, I was 100 yards down the road. The new Nissan Leaf has a more powerful motor than its predecessor, and it certainly is the case that this car is very powerful when needed. Having discovered this exhilarating performance, I confess I was tempted to try it out on the roads between Malvern and the motorway, but I thought better of it, as I did not want to risk damaging it. Perhaps in 2019 I might be able to afford to buy one of these demonstrators, and so have the pleasure of driving one every day. The only point of controversy I have heard about is that neither the old Nissan Leaf nor this new one have an active battery temperature management system. I believe there is ventilation for the battery compartment while the car is moving, but no fan, or refrigeration, or warming. Some of the old Leafs, used as taxis, have reached 100,000 miles and more without any major battery degradation. I have also read that the old Leaf, prior to 2013, had an inferior battery chemistry, which did lead to some adverse reputation with Leaf batteries, which has not been relevant since then. The 2018 Leaf uses a further refined battery chemistry, which is how the 40 kWh battery fits into about the same space and is about the same weight as the old one. I would imagine that it would only be of possible significance in extreme climates where it is either exceptionally cold or hot, or both. In many European countries, especially the UK, the temperatures are very temperate all year round, so battery temperature and degradation issues are less of a concern. Another thing I have read is that the software limits the rate of charge if fast charging for a second time in succession. This is to protect the battery. In a journey of 175 miles, I did not need to fast charge at all, so I do not think that is very relevant either. Your destination would have to be over 300 miles away for that to have any relevance. In a road trip of up to 300 miles, you would only need to fast charge once on the way, plug into level 2 at the destination, and then fast charge only once on the way back. I can only say that, for myself, I am never likely to be driving to any destination over 300 miles away, so that issue would not bother me at all. With or without the automatic parking, the new Nissan Leaf is certainly a very good car. It is comfortable, spacious, stylish, and powerful. It has good road holding, has very adequate range, has fast charging speeds, and, in my view, is one of the best cars you could buy for that price today. Electric vehicles always provide a superior driving experience to any conventional car, but the new Nissan Leaf is also an exceptionally good electric vehicle, and a very worthy successor to the best-selling Nissan Leaf that came before it. I can thoroughly recommend it. For technical details and prices, click on the link here.